Can understanding how forest elephants communicate help scientists find ways to protect this vulnerable species? 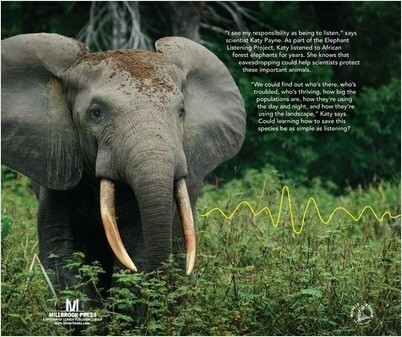 Researcher Katy Pane and others involved with Cornell University’s Elephant Listening Project believe it can. Patricia Newman takes readers behind the scenes to see how scientists are making new discoveries about elephant communication and using what they learn to help these majestic animals. Patricia Newman has a passion for uncovering fascinating aspects about our world and crafting books that lead children on an adventure of discovery. She gravitates toward stories about animals and conservation science and enjoys sharing her excitement with readers. Books include Sibert Honor title Sea Otter Heroes: The Predators That Saved an Ecosystem; Junior Library Guild Selection Eavesdropping on Elephants; Bank Street College Best Book Zoo Scientists to the Rescue; Booklist Editor's Choice Ebola: Fears and Facts; and Green Earth Book Award winner Plastic, Ahoy! Investigating the Great Pacific Garbage Patch. She frequently speaks at schools, libraries, and conferences about writing and conservation. Visit her at www.patriciamnewman.com.